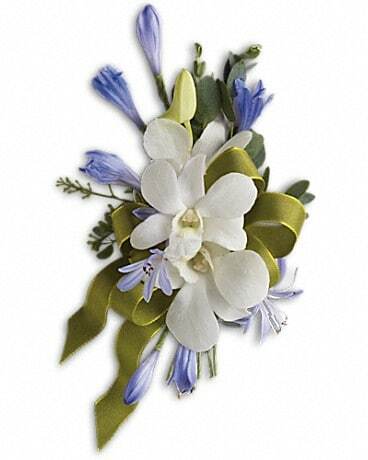 We create this wrist corsage using white dendrobium orchids and blue accent flowers. Created using a silver stretch wristband, or choose and rhinestone or pearl wristlet at right. We will use a white irredescent ribbon, or leave us a note at checkout with your color preference: silver, gold, navy, royal blue, etc.